Birmingham City go into today’s game against Southampton hoping to continue the unbeaten run that has propelled them into the top six of the Championship. Tuesday night’s demolition of Leeds United saw Blues move into fourth place, just two positions and five points adrift of Nigel Adkins’ Saints. Southampton were quick to get out of the blocks this season and established themselves as early pacesetters, lately however they have found the going a lot tougher, losing three of their last five games, whilst Blues remain unbeaten in the league at St Andrew’s. Chris Hughton will wait on a late fitness test before deciding whether to include Nikola Zigic in today’s squad. Tuesday night’s four goal hero took a knock to his knee during the rout at Elland Road. Marlon King is back in contention after missing the last two games because of a groin strain and Guirane N’Daw is available for selection following Senegal’s early exit from the Africa Cup of Nations. 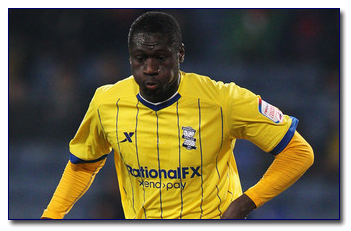 Speaking to bcfc.com, Chris Hughton said: “It is a huge game because a good result puts us in a very good position. “A poor result, and good results behind us, could drop us down three or four positions – that’s who tight it is. “We’re up against a real top team in this division and in (Rickie) Lambert they have if not the best striker in this division, then one of the best. “They also have (Billy) Sharp, who is a tremendous finisher, and, probably as a two they would be as proflific as any. “They are a very good side and deserve to be where they are. “They have a good team ethic and play the game in an exciting way. “But we’re at home and we’re in good form ourselves and the onus will be on us. “Knowing what to expect, we have got to cope with what they throw at us and show enough ourselves to win the game. This entry was posted in BCFC News and tagged bcfc, birmingham city football club, championship league, chris hughton, football league championship, guirane n'daw, marlon king, nikola zigic, southampton. Bookmark the permalink.